Front line leaders have the opportunity to help reframe their employees’ experience and help them re-engage and be productive. How? Using the analogy of hosting a dinner party of course! 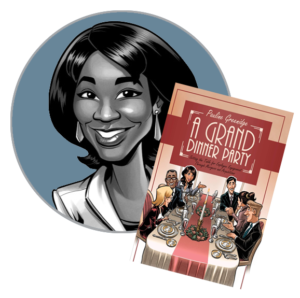 When you think about it, a dinner party is planned and purposeful. When we invite someone to our table, it’s because we want them there and we are intentional about the experience we want them to have in our home. Let me share 3 simple and relevant analogies of how leaders can help employees re-engage: Mindset of Invitation, Being a Good Host and Staying Connected. An invitation is thought out and planned. When we invite others to our home we are clear about who we are including and why. When it comes to re-engagement, one of the most important things we can do is be intentional about how we interact with employees. During challenging times, leaders and teams get so busy juggling multiple priorities and conducting day-to-day work, that they forget to look for ways to include and share with employees. An example of employing a Mindset of Invitation in the workplace is asking employees for their opinions on how to approach the work ahead or how to resolve a nagging or complex business issue. This is just one of many ways to help employees align and re-focus their efforts to stay productive. A good host welcomes guests to their home and is attentive to make sure they have a great evening from the time they arrive, through dinner, dessert and until they leave. Imagine inviting guests to your home and then leaving them at the front entrance and not connecting with them for the rest of the evening. Sounds silly, right? At work, being visible and available is critical to re-engaging employees. Being available means setting aside time (scheduled or unscheduled) for employees to meet about concerns, issues or successes they want to share. Leaders create a positive impact when they regularly go to their employees’ workspaces and spend a few minutes checking in to see how things are going with their employees. Be a good host and be visible and available. When you have guests in your home, you want to stay connected to them by ensuring they have enough to eat and drink and are included. You communicate with them because you care about their experience while they are there. When leaders communicate regularly, it helps re-engage employees because it rebuilds trust. When employees trust they can move forward with the work ahead. Revisit and the vision and purpose of the company. Be clear about expectations for each employee and the team as a whole. Clarifying what specific outcomes the team are responsible for and by when. Many organizations struggle with providing clear goals and outcomes for their teams to work toward when things are in flux. Be as clear as you can and communicate what’s expected especially if things shift along the way. When employees do achieve successful outcomes, remember to recognize it! Be a good host and set the table for employee re-engagement. For more ideas on helping employees re-engage, download my free Re-Engagement Checklist for Leaders at upwardhr.ca.